This is the fifth post of our 6 part series, Bicycles at War. The original single-speed hipster. A Swiss conscript riding a standard issue, shiny-new Modell-05 bicycle, circa 1990. The Swiss Army bike regiments were tasked not with offensive reconnaissance, as many bicycle units had been during the Great War, nor with logistical supply as in Vietnam, but were rather a quick-strike (Handstreich), defensive unit. For five hundred years the Swiss have pursued a policy of armed neutrality. While there were occasional border skirmishes and accidental bombings in the First and Second World Wars, Switzerland hasn’t been truly at war since it was conquered by Napoleon Bonaparte in 1798. It is a naturally defensible country. The Swiss Army, therefore, trains to defend their country. And for that purpose, the bicycle reigned supreme for one hundred years. Regardless of whether Switzerland was being invaded from the east by the Warsaw Pact or from the west by NATO, the bicycle regiments were expected to quickly and quietly traverse both rural and urban settings to ambush motorized forces. The original Swiss Army bike, Ordonnanzfahrrad Modell 05, or MO-5 for short, was introduced in 1905 and remained in service for nearly ninety years. The bicycle began service in the Swiss Army in 1891 as a courier vehicle. Enlisted soldiers assigned to headquarters would bring their bicycle from home, as they had done previously with a horse or pony. In 1905 the Swiss Army introduced the first standard bicycle, or “Ordonnanzfahrrad,” the Modell 05. It was built “army tough,” weighing 22 kilograms, or almost 50 pounds. With just a single gear, riding the MO-5 up an alpine pass would have been a challenge, to say the least. And descending a pass would have been even more exciting, as the MO-5 had just a spoon brake on the front and a coaster brake on the rear (upgraded to a drum brake, post-World War II). Thankfully one of the frame bags included all of the tools necessary to field strip the MO-5, as a single, substantial descent would have burned off all of the grease in the coaster brake. A spoon brake on a rat bike. Spoon brakes use the tire itself as a braking surface, as opposed to the rim, the hub or a disc. Facing a shortage of spare parts for the MO-5, the Swiss Army introduced a new bike in 1993, dubbed the Militrrad 93, or MO-93. The MO-93 was equipped with a rear derailleur and seven gears, a hefty derailleur guard, and (then) state-of-the-art cantilever brakes. His is bigger than yours. A Swiss soldier poses with his Modell-93 bicycle, circa 1999. In addition to a sprung leather saddle, it also carries a bazooka and a bicycle helmet. 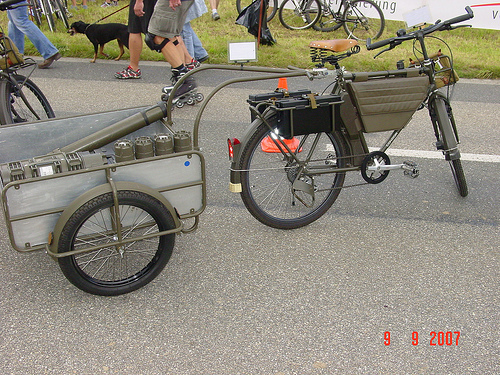 A Velo ’93 with an army-issue cargo trailer, now relegated to vintage parade duties. , belie that the M-12 is meant for “cadet officers, sergeant majors, quartermasters, cooks, guards…physical training, and movement between barracks and firing range,” but not the frontline. 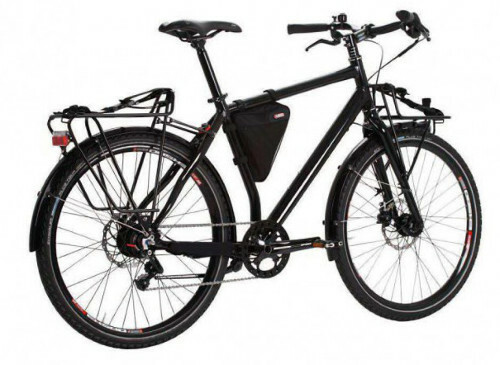 The Velo Zwolf, introduced in 2012, is the epitome of utility. On April 1st, 2015, a Swiss news site published a satirical article announcing the reinstitution of the bicycle regiments. The Swiss bicycle infantry was phased out in 2001 but a defense department spokesman said late Tuesday that its resurrection would help deal with the thousands of recruits who are out of shape. Spokesman Thomas Fisch said the army favors the return of the single-speed bicycles used continuously by the army between 1905 and the 1990s. Frankly, young Swiss men used to be fine specimens of manhood, but today many have let themselves go, Fisch told The Local. The bikes, equipped to carry food rations and battle gear, weigh a hefty 25 kilograms or more, making them challenging to maneuver in mountain terrain. In addition to being useful for improving the fitness of soldiers, the army says bicycles will play a vital part in national defense. “Frankly, we’re getting a bit worried by the French and their crack Segway regiment,” Fisch said. Maurer, concerned about the overuse of motor vehicles by the military, wants all recruits to take their turn in the bicycle infantry around 10,000 a year. I’m wondering about the Swiss Guard that is tasked to protect the Pope. Do they patrol au velo? Those voluminous pantaloons and formidable headgear must provide for some fiddly moments. Does the Vatican have a buttock review to ensure proper fitness amongst the troops who are charged to defend realm? Just bought MO5 with serial number 1358. One break only, so seems before 1944… Could you, please advice how to check whats the production year ? Hi, I’m looking for both front and back tyres for a vintage swiss army bike, 1955. size 26 x 1 and 1/2. Please help. Simon in Australia. +61-401-191-321. I purchased a Vintage 1985 Swiss Military bicycle; which in a box with handlebars removed. Q: How do I put this back together again?